Anyone have a G3 their parting out? I need the small tab that the single bolt of the e-brake cable bolts too. To explain it better, our e-brake lever has two studs on the front that bolt through the firewall. But on the front side (near the release cable), there is a single bolt that goes horizontally into the hinge post. Theres a small vertical piece of metal there with a nut welded to it. I need that piece. Attached is a pic of it but the vertical nut is missing. Re: Anyone parting a G3?? 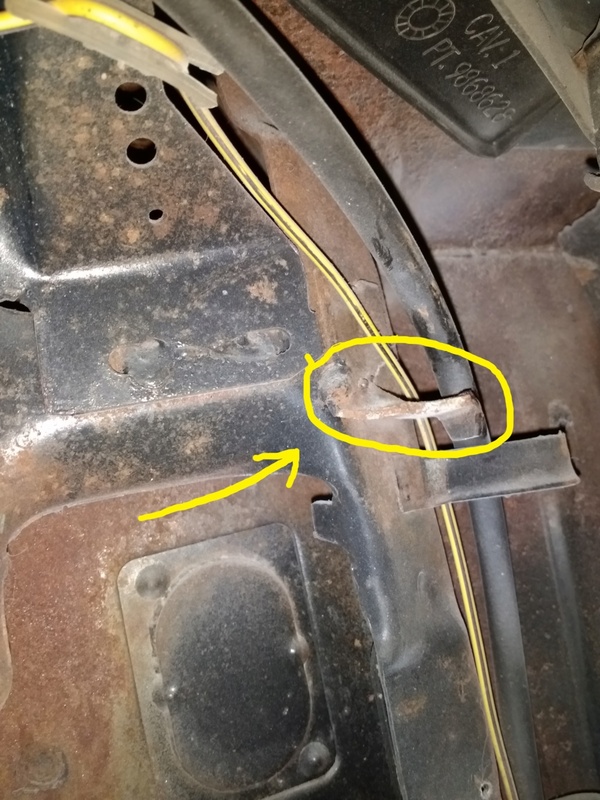 E-Brake mounting tab needed. I know where there is a elco sitting. I haven't seen the guy in a year. I'll stop by this week and see if he still has it. He was a member here at one time. Couldn't you tack a nut on the piece you have? I'm waiting to see if limey comes back with the part from his buddy. Otherwise I'm just going to take a small piece of heavy angle iron and tack a nut to the back of it. Pretty easy fix but I'd like to have the right piece. OK, I'll see if the elco is still there in the meantime. Is it on a regular Laguna? I’m sitting on a 73, I’ll check in the morning. Yes, any GM vehicle should have that horizontal bolt on it going into that tab. I'm still waiting if Limey located one. I'll let you know. Thank you.